Private Beaches In Florida Spark Battle With Residents And County As of July 1, homeowners with beachfront property in Florida's Walton County can declare their beach off-limits to the public. That has sparked a battle with local residents and county officials. Santa Rosa Beach in Walton County, Fla., with a privately owned section that is part of Vizcaya, a residential development. In Walton County and in Tallahassee, where Gov. Rick Scott signed it into law, an earlier version of the bill was known as the "Huckabee amendment." Fox News commentator and former Arkansas Gov. Mike Huckabee has a beachfront house in Santa Rosa Beach. Since the bill went into effect, opponents of the law have speculated about Huckabee's role in getting it passed. In January emails to Kathleen Passidomo, the bill's sponsor in Florida's Senate, Huckabee thanked her for helping protect property rights from what he called " 'customary use' abuse." "Having grown up dirt poor in Arkansas, I never thought I would see saltwater in person, much less live on a beach," Huckabee writes. But he says he has been appalled at what he has found on his beach property. "I've found used condoms on my walk-down, glass bottles broken, dog feces, litter. Sharp tent poles that can cut bare feet and worse. Large tents with large groups with boom boxes make using my own property very difficult during high season." In a follow-up email, Huckabee accurately predicts a backlash to the law. "I'm certain there will be a flood of political pressure to stop your bill because there are only 900 beachfront owners and many of them only live part time there." That political pressure was on display this past weekend when Scott, who is now running for the U.S. Senate, scheduled a campaign appearance at a doughnut shop in Santa Rosa Beach. About a dozen protesters concerned about beach access showed up and Scott's campaign changed its schedule, skipping the doughnut shop. The protests have been going on since shortly after the law went into effect. Last month, Daniel Uhlfelder was part of a group enjoying the sun and sand on a private beach in defiance of the law. They had just begun unfolding their chairs and putting up their umbrellas when, Uhlfelder says, a security guard hired by a nearby development told them they'd have to leave. "I said, 'We're not going to leave.' He called the police. The police came. The police took everyone's driver's licenses and asked if we're leaving. We said, 'We're not leaving.' "
Uhlfelder and other beach access activists are determined to challenge the new law. Up to now, their fight has been largely focused in Santa Rosa Beach at an upscale development called Vizcaya, where large houses overlooking the beach rent for thousands of dollars a week. The president of the homeowners association, Bill Hackmeyer, says: "There are a lot of public beaches and there are a bunch of parks around here for the public. But there are some beaches like Vizcaya that are private beaches." Daniel Ulhfelder, his family and other activists hold a "sit-in" on the Vizcaya beach in defiance of the recently passed Florida law. Hackmeyer is a conservative and outspoken property rights advocate who on this day is wearing an Ayn Rand T-shirt. 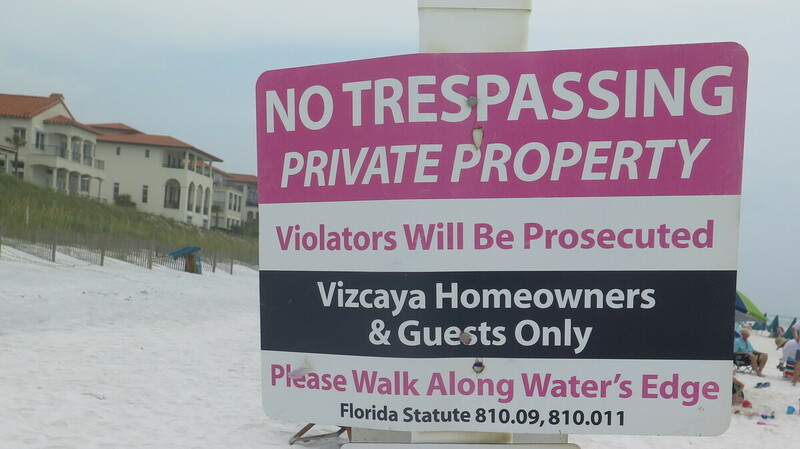 Because the beach here is privately owned, Hackmeyer says, people who don't live in Vizcaya are legally only allowed on an area of wet sand near the water's edge. "People can walk up and down the wet sand and they can sit on the wet sand," Hackmeyer says. "They can't sit on the dry sand." When they do, it's considered trespassing. The homeowners association's security guard asks them to move. If they don't, he calls the sheriff's office. 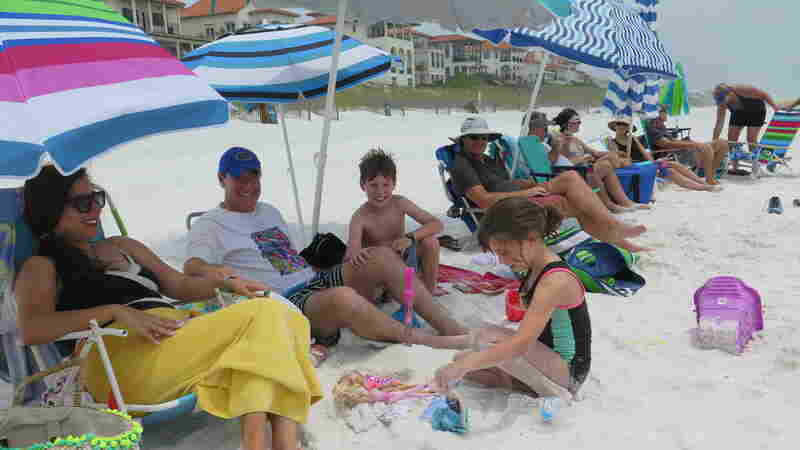 Walton County Sheriff Mike Adkinson says his deputies explain the law and, when necessary, ask beachgoers to move to a public beach. Despite demands from Hackmeyer and other homeowners, no arrests have been made. Adkinson says, "No one has [gone] to jail in Walton County for trespassing on the beach ever." Like Uhlfelder and other open-beach activists, local county officials don't like the new law. For more than a century, the public enjoyed largely unrestricted access to the beaches in Walton County. County attorney Sidney Noyes says that under a legal concept known as "customary use," it doesn't matter who owns the beach. "If we can establish that the public has customarily used the beach," she says, "the idea is that the beachfront property owner cannot exclude the public as long as the public is using it for traditional recreational uses." Over the past decade, big changes have come to this quiet stretch of the Florida Panhandle. The area has caught the eyes of developers and wealthy buyers looking for a beachfront getaway, including Huckabee and GOP political consultant Karl Rove. More and more "private beach" signs have sprouted at new developments in Walton County. Some even have erected fences and gates on their beaches. For County Administrator Larry Jones, it's a troubling trend. Preserving public access to beaches, he says, is at the heart of the local economy. "Simply put, the beach is the attraction," Jones says. "It's a multimillion-dollar proposition that brings thousands and thousands and thousands of jobs, 3 million tourists a year that spend an awful lot of money here." To protect its economic interests, the county passed an ordinance asserting the public's right to access private beaches. In response, wealthy homeowners pushed for a bill that was approved by the state Legislature, essentially undoing the county law. The county is now holding hearings and writing a new ordinance establishing the public's right to use private beaches. But it's likely to take many months and face legal challenges. In the meantime, activists like Rachel Reichenbach say they'll keep pressuring the state to repeal the law and open the beaches to all. She says, "This is important not only for our access as people to our beaches that we've always had access to, but it's critical for our economy." For Scott, who signed the bill into law, it has also become a political issue. Scott is running for the U.S. Senate, challenging incumbent Democrat Bill Nelson. Nelson was on Santa Rosa Beach last month, calling on the governor to convene a special session of the Legislature to fix a law that is now a hot button issue on the Florida Panhandle.